This moment? This right here, right now? It grabs my eyeballs and makes me stop reading my book and look up. The girl is sitting beside me on the brown exactly-the-right-amount-of-squish couch in our half painted “wooden room”; half painted because I started it a year and a half ago on my christmas break and got knocked down by the flu and somehow ….. well, somehow a year and a half later happened. Still, if you look at the room a certain angle and don’t look up near the ceiling, it’s a perfect rustic oatmeal white just like I wanted it. Halfway done reminds me not to take every last thing too seriously. If it gets done this summer it will be glorious and I will feel very grown up in my oatmeal white room. If it doesn’t, because maybe I took too many walks and had too many talks? Then halfway done will be an altar to what matters most to me. For right now, the window across the room glows early evening sunset, the breeze is the perfect ever so slight humid spring rain- in- the- air and I accept the gift. Today was a page in the mental diary I keep of small things deserving big thanks. The girl picked me up from my first day back at work from spring break. My feet hurt from getting over the shock of using them again all day but my heart felt light and smiley. I love that I don’t hate being back at work. My job is a place I know I belong and I like that knowing. We headed off to the courthouse to pick up a packet of information I will need for the next several weeks on how to juror. I do not want to know how to do this but somehow I was not able to get out of it so……I take my packet and find myself thankful I am not myself in need of a jury. If I have to be involved, I’ll take this side of the law. We get to our front door hungry and begin our coming home routine like a Fred Astaire dance number. We each know our plan, our part, without even having to discuss it and we deftly change clothes, start the washer, grab ingredients and knives and cutting boards, dipping and dodging around one another. Within minutes we are sitting at the speckled kitchen table eating our homemade pizza of roasted asparagus, huge curls of fresh parmesean and roma tomatoes all melty and crunchy at the same time. “Mmmmm!” we say quietly and look out the window as we eat content. We read out loud together most every evening. I did that with all my kids as they grew up and it still wraps up the day in comfort; the lull of our voices as we find a thing to talk about and roll over in our minds. We explore the world and it’s ideas and what we think of it. We finish it off with our current bible study and snap the book shut. “That was good lesson, Mama,” says the girl and I look at her and smile. The dryer buzzes it is finished with our days’ clothes and I get up to go sort them out, grateful that it is just a room away and not a walk to a river somewhere. I brew a cup of half-caff to cradle as I reach for my current all-by-myself read The Yellow Envelope by Kim Dinan and the girl goes to her college book. The coffee and cream ratio in my mug is perfect. I try and drink as I read but my reading glasses fog up with each sip and the words become ghostly versions of themselves. I shift the mug to the side of my mouth and try again and then spit laughing at my awkward little self who just wants her coffee and her book. The girl looks up from her studies. “Oh Mama….”, she shakes her head at me with the bemusement that comes from having gotten used to a quirky parent. We don’t have to explain ourselves. We just are and that’s ok.
I’ve been a sad little worried about my across the street neighbor. He’s lived there several years and you can set your calendar to spring weather because on the very first day of tolerable warm he will be in his lawn chair on his little side porch watching over the world on Main Street from dawn to dusk. This year, though, the warm days came several days in a row and the chair across the street remained empty. Come to think of it, when was the last time I’d seen him; last fall?? My friend around the corner and I swapped concern and I kept vigil for movement. Finally, today he emerged. “Where were you? ?” I scolded with a smile. “We were worried! Don’t do that again! We need you on your porch!” He laughed. I don’t think he realizes that we had counted on seeing him season in, season out. Come to think of it, I don’t think we realized it either…..until he wasn’t there. The Mayor of Main Street. That’s what we named him. My phone rings. It’s my friend, Sarah. She rarely “needs” or “wants” anything specific. She usually doesn’t talk long. She just wants to remind me that she is there and I am here and we are friends. She checks on her people. I like that about her. She is an example of making the effort to “see” and I am so fortunate to be seen by her. I hang up warmed by the embers she lights and passes on to others. Sarah is a grounding point that helps me keep my hearts’ home in focus. “Then I whispered the most important prayer of all, that blessing of the blessed: “thank you”. I go to look out at the Mayor across the street. He’s still there. The phone dings a message from my boy in Montana. It looks like the plans to go see him this summer are set. The girl turns off her computer, ready to watch a favorite program. I will pour a bowl of cashew and cacao granola and almond milk and pull on a hoodie for sleep. I sit early in the morning, too early to need to be awake. I think to turn on the Rainy Mood app on my tablet and adjust the thunder, birds and rain intensity and smile to myself as it plays out in the darkness of my room. Weather preferences at a click, no umbrella required. Comfort wraps me up in dry raindrops that fall in my ears. I grab my current read and turn on a soft lamp. Everybody Always by Bob Goff. He talks about a neighbor across the street from his home, Carol; a neighbor who had become family. She was widowed and older. She had just been given the news that cancer had come to take up space in her body and quietly entrusted him with two small words….”I’m afraid.” He drove to the store and bought two walkie talkies; one for her, one for his family. He set it up beside Carol’s bedside and ran home to try it out. “Hi Carol!”, said Bob. He listened to the crackly static. “Bob! Is that you? !”, said Carol. Comfort was born in the sound of that static. I put down the book and looked at the clock. It’s past going to sleep again and I walk to the Keurig and press start. The gurgling waterfalls over the coffee pod and the sound smells like peace. Comfort falls into my cup and I carry it back and sit on the couch. Thank you, Father God, for sounds that move me to see and smell and touch and respond; for the comfort that spreads over my life because I can hear. Static on the other end promises a response to words heard by a friend who was listening. Gurgles from a coffee maker form the steam curls of provision for things I don’t need but yet still decorate my life with small moments. Birds and thunder and raindrops, real or recorded, remind me to look for the hand of my Creator. Thank you that hearing causes me to see. I love you too, God. I sit across the room, music narrating the early morning mood. Rabbit Room 2018 is playing on Spotify and I perk up when Mr. Rogers’ theme starts playing, sung by JJ Heller. I bought myself a small jar of pre-brew cinnamon coffee spice and a bag of Michigan cherry coffee beans yesterday and saved it till today to grind up a small cup of joy to sit with and savor. I smile to myself at how much gratitude I feel at buying myself such a small thing. It isn’t lost on me, those small graces that are completely superfluous in this world of need versus want; that I can reach up and take it off the shelf and buy it. I start to think this morning of those who have no shelf to reach to. It stirs me up inside, as I look out the window, and think of the world on the other side of the glass. The chair in my view catches my attention. I found it in a small antique store across the street from my house several years ago. It used to live in a downtown hotel in Cincinnati, the Vernon Manor, which has long since disappeared; the same hotel in which part of the motion picture Rainman was filmed. 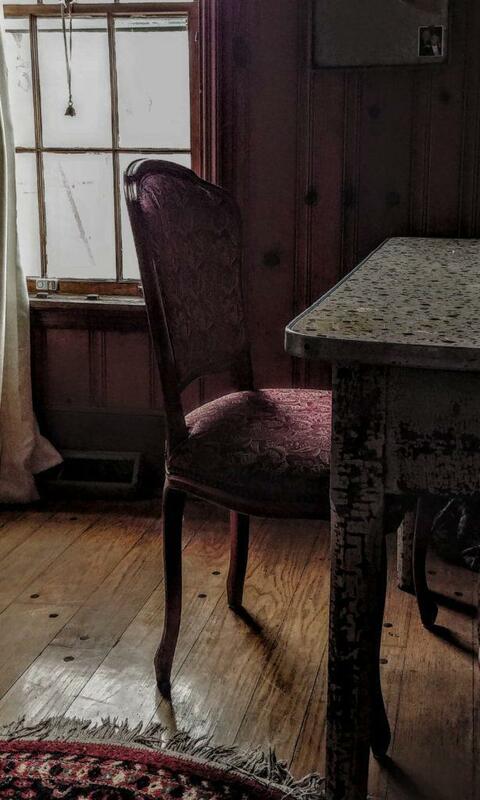 Somehow, this little chair wandered into a small shop in a small town in Kentucky and now sits here with me keeping quiet company, it’s memories held silent. I want to interview it but I can’t figure a way to get a chair to open up and speak. Empty chairs make me wispy. I think of all it’s eavesdropped on, through no fault of its’ own; who has sat in it, who isn’t sitting in it now, who will never sit in it again. It’s remembering standing and looking me right in the heart. And it’s longings still to be fulfilled, holding up a hand to pull me towards and past the window. I want to carry that chair with me so that, wherever I go, someone will have a place to sit and catch their breath from a life race they’re running. To be able to sit and whisper the scary thing they’re afraid to say out loud to the world in case the thing hears them and gets scarier. To show me pictures of the birthday party or the vacation of a lifetime or the child who graduated when they thought they’d never make it out of school. To laugh at the time they tripped and EVERYBODY saw it. To hold their heart in their hands because it’s falling apart and feels like it’s out of their body. To be a person who is seen and heard. To sit in a comfortable chair. Just for a minute, if that’s all the time they can spare. To wonder aloud with them….how the matter will turn out. And to watch and wait and keep company together to make the wondering less alone.